The No. 4 features a complex spring-loaded gear and clutch mechanism on the ends of both roller cores. With only minor modifications (models before 1938 did not have pedal activated grippers), the No. 4 was in production for 25 years. 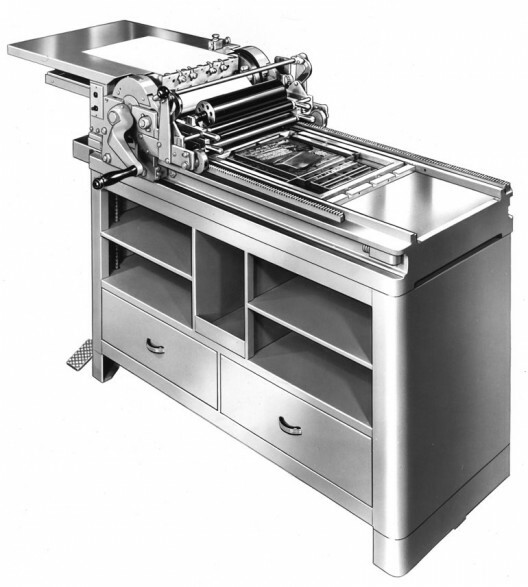 The 4T is differentiated by the addition of a transparency adapter, mounted above the inking assembly, used to eliminate wrinkling of cellophane and glassine proofs. These proofs could then be contacted to film for offset negatives. Most transparency assemblies have been discarded. For modern practice, it is more important to know that the 4T has a deeper cylinder undercut (.070″). Traveling sheet delivery tray is standard. Maximum form: 14 × 18″; maximum sheet: 14 ¾ × 20″. There are more than 300 No. 4 and 4T presses listed in the Vandercook census. The nearly identical 215 has a different cabinet and a wood feed board with two swing-out paper shelves (like the 219 New Style and 219 Old Style). The Vandercook census shows a dozen of this variant.